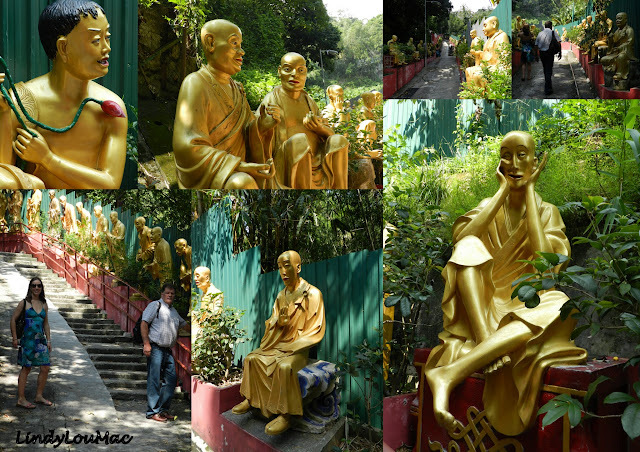 While we were in Hong Kong in October 2011 visiting our daughter, we took a trip out to the New Territories with her to visit the Ten Thousand Buddhas Monastery. 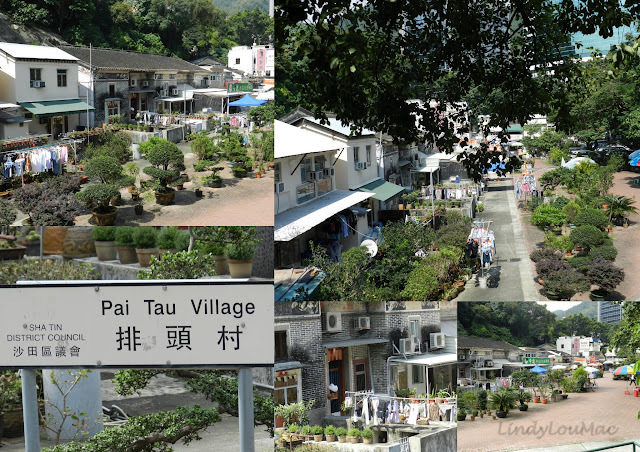 By taking the MTR train to Sha Tin station, the first thing you see when leaving the station is the old village of Pai Tau, tucked in below the surrounding new developments. With the village on your left continue walking a short distance to the junction with Pai Tau Street, take a left into this street, then take the first right, Sheung Wo Che Road, past the local Government Offices and a multi storey car park. At the end of this road you should see the yellow direction sign for the path and steps leading up to the Monastery. This is where the steep uphill climb of 431 steps to the lower terraces of the Monastery starts and the path is lined with the first of the many more than 10,000 Buddhas that are on display. The Monastery was founded in 1949 by Yuet Kai who was born into a wealthy family in Kunming in southern China in 1878. At the age of 19 he decided to dedicate his life to Buddhism and in 1933 Yuet Kai moved to Hong Kong to preach Buddhism in a local monastery and soon found many followers. He decided to found a monastery and construction of the Ten Thousand Buddhas Monastery began in 1949. Yuet Kai himself, although by now approaching old age, personally helped in the construction by carrying materials, with his disciples, from the foot of the mountain. The monastery buildings were completed in 1957 but it took a further ten years to complete all the miniature Buddha statues, now on display around the walls of the main temple and which actually number almost 13,000 (in Cantonese tradition “ten thousand” simply represents a figurative term for an extremely large number). Yuet Kai died in 1965 at the age of 87. Built on a plot of over eight hectares on two different levels on the forested hillside overlooking Sha Tin, there are five temples, four pavilions, one verandah and a pagoda. In 1968 the monastery underwent substantial renovations when many of the statues were coated with pure gold! 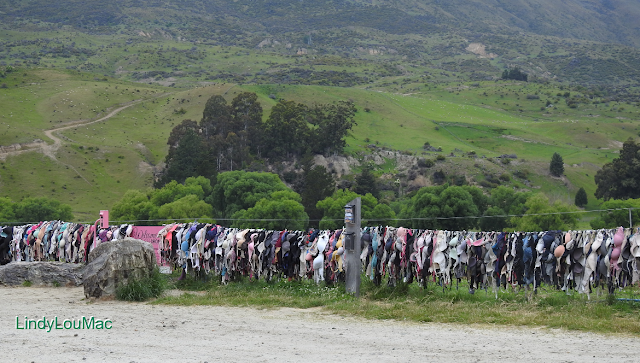 In 1997 some of the buildings were severely damaged by landslides causing the site to be closed to the public for over two years for reconstruction, which is in fact still going on to this day. The pagoda achieved some fame when in 2001 it was selected to appear on the HK$ 100 banknote. In the centre of the terrace between the main hall and the Pagoda is the Kwun Yam, (Goddess of Mercy) Pavilion. My final photo is a collage is of the beautiful roof of this pavilion and the water lilies in the pool surrounding her. Admission to the Monastery is free and it is open daily from 9am to 5.30pm, unless there is heavy rain or a Typhoon signal above Level 8. There is a Vegetarian Restaurant on site open every day except Thursday where we ate and enjoyed a traditional meal. With thanks to the Hong Kong Extras Website for some of the information included in this post. you got the roof drawings in vivid details, lovely. I have visited the Thousand Buddhas in China and i am amazed at their creativity of making the 1000 moods of the Buddha. I appreciate much the laughing buddha. I guess there might be many 'thousand buddhas' in Chinese territories. You've done a good job of giving details and information beneficial to travelers. I missed out this place, so thanks to your post, I get to see it through your eyes. Most Buddha statues in Buddhist Temples in Asia are not portrayed in casual poses like this. Very interesting. Wow it is so beautiful. You must have stay in HK for a long period to cover so many places. This sounds like such a fascinating experience. 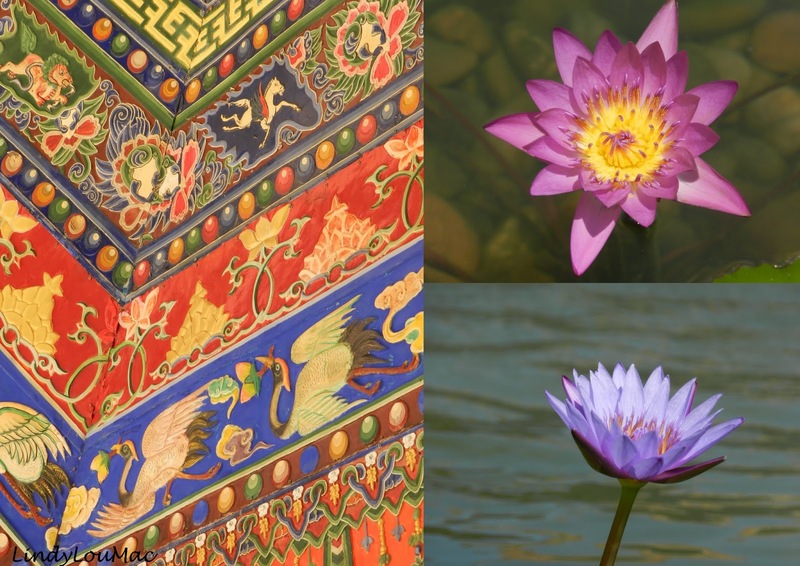 It must have been worth the climb to see the temples, the pagoda, the pavilions and the water lilies that are so beautiful then enjoy a meal. On the way up you could stop and take in the expressive quality of those statues. Thanks for sharing. This is so fascinating! Thanks so much for sharing. I'm glad I found your travel blog! Beautiful pictures and such an interesting travelogue -- definitely not something I would have expected there for some reason. Travel (even virtually) is such a great learning experience. I really enjoyed looking at the beautiful pictures. Thank you for sharing them. Also, thank you for visiting my blog. I just completed a couple new articles. I wish I read this post before I went to Hong Kong. It would have maximized places to have visited. Ah well, maybe next time.